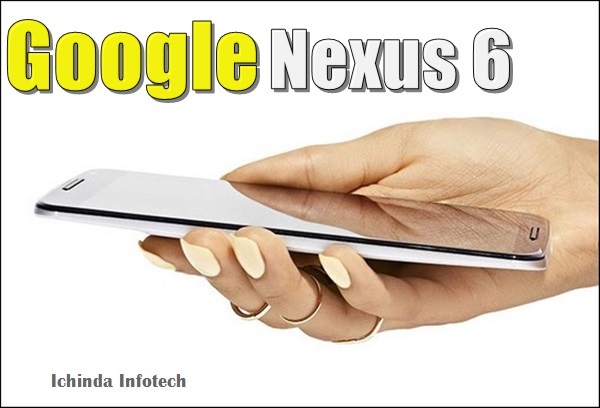 The all new Google Nexus 6 with Android 5.0 Lollipop, QHD display and 13-MP Camera finally unveiled on Wednesday, 15th Oct. 2014. Nexus 6 will be available in US market from 12th November via Google Play store priced at $649 (approx. Rs. 40,000) for 32GB and at $699 (approx. Rs. 43,000) for 64GB without Contract in in Midnight Blue, Cloud White colour option and pre-order will start from late Oct. 2014. The all new Google Nexus 6 supports Single SIM(GSM), 4G, 3G, Wi-fi, Bluetooth, USB, GPS and NFC also supports 68+ languages(Basque, Bengali, Burmese, Chinese (Hong Kong), Galician, Icelandic, Kannada, Kyrgyz, Macedonian, Malayalam, Marathi, Nepali, Sinhala, Tamil, Telugu), Android TV and a A range of new professional photography comes with a 5.96-inch QHD (1440×2560 pixels) display at 493PPI for playing games and watching movies with stunning clarity powered by a 2.7GHz quad-core Qualcomm Snapdragon 805 processor promising lightning fast multi-tasking with 3GB RAM, 32GB and 64GB internal memory runs on world’s most advance operating system Android 5.0 Lollipop OS sporting a An f2.0 lens and 13-MP camera with optical image stabilisation, advanced computational photography technology and HDR+, the pre-installed Google Camera and 2-MP front camera. Nexus 6 powerful 3220mAh battery offers you up to 6 hours of use from only 15 minutes of charging and over 24 hours of use from a full charge measures 82.98 x 159.26 x 10.06mm and weight only 184gm. Superb phone but a very high price. Hope it gets a price drop so tahi i can buy it. 40,000 is too high for me.